Lenovo just announced the two latest additions to its smartphone portfolio. The company unveiled a couple of Android 4.4 KitKat-powered droids dubbed Vibe X2 Pro and P90. The Lenovo Vibe X2 Pro is certainly the better looking half of the duo, sporting a striped design similar to the Vibe X2 that debuted at IFA last year. The smartphone is powered by the 64-bit Snapdragon 615 chipset with 1.5GHz octa-core Cortex-A53 CPU and features a 5.3" 1080p IPS LCD. The dual-SIM Vibe X2 Pro packs 2GB of RAM and 32GB of microSD-expandable storage. Its camera department is particularly interesting with the smartphone packing two 13MP cameras - one with LED flash at the back and another one at the front for selfie purposes. 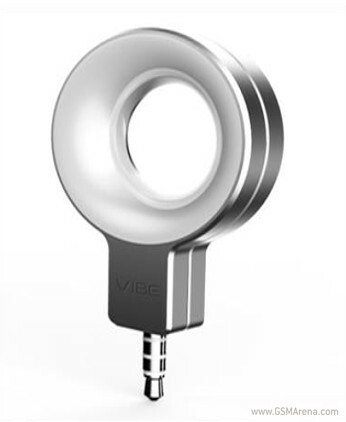 There’s no flash for the front unit as on the HTC Desire Eye, but Lenovo has designed a cool flash accessory for the Vibe X2 Pro that plugs into the 3.5mm audio jack and provides nice even illumination thanks to its 8 diffused LEDs. The Lenovo Vibe X2 Pro fits a 2,410 mAh battery inside its 146.3 X 71.0 X 6.95mm body that tips the scales at 140g. On the connectivity side, the smartphone is well covered with various radios including LTE Cat.4 and Wi-Fi ac support. Lenovo Viber X2 Pro will be available in Champagne Gold, Rock Pink and Electric Blue. It will launch in April but its price is yet to be confirmed. The Lenovo P90 is powered by an Intel Atom Z3560 chipset with a 1.83 quad-core CPU and it sports a slightly larger 5.5" 1080p IPS LCD. It also has 2GB of RAM and 32GB of storage, but comes with an ampler 4,000 mAh battery. Connectivity is evenly matched between the two new Lenovo phones, but the P90 isn’t quite as slender at 150x77.4x8.5mm and 156g. It also lack dual-SIM capabilities, settling for a single LTE-capable slot. The Lenovo P90 will be available in Pearl White, Lava Red and Onyx Black in February, but once again no price has been mentioned. Design ripped off from Sony and the concept of the layer phone which looks like a phone that is stacked on another phone like a sandwich ripped off from the Jolla phone. This isn't anything original by Lenovo.